CHARMING 3 BEDROOM, 2.5 BATHROOM RANCH IN THE AWARD WINNING PARKWAY SCHOOL DISTRICT! THE FRONT DOOR LEADS INTO THE BRIGHT & SPACIOUS GREAT ROOM W/ VAULTED CEILINGS & LARGE WINDOWS OVERLOOKING THE BACKYARD. THE GREAT ROOM IS OPEN TO THE KITCHEN & BREAKFAST ROOM. THE KITCHEN HAS TONS OF CABINETS FOR STORAGE, A PANTRY & A BREAKFAST BAR. THE MAIN FLOOR MASTER BEDROOM SUITE HAS A LARGE WALK-IN CLOSET & PRIVATE FULL BATHROOM. ANOTHER FULL BATHROOM & 2 BEDROOMS ON THE MAIN FLOOR. FINISHED WALK-OUT LOWER LEVEL W/ A GIGANTIC RECREATION ROOM, A POSSIBLE EXTRA BEDROOM OR OFFICE & A HALF BATHROOM W/ ROUGH-IN PLUMBING AVAILABLE TO EASILY CONVERT INTO A FULL BATHROOM. THE BACKYARD IS PERFECT FOR ENTERTAINING W/ A PAVER PATIO & A LARGE DECK W/ A RETRACTABLE AWNING PROVIDING MUCH NEEDED SHADE IN THE SUMMERTIME. NEWER A/C & FURNACE (2010). IN-GROUND SPRINKLER SYSTEM! 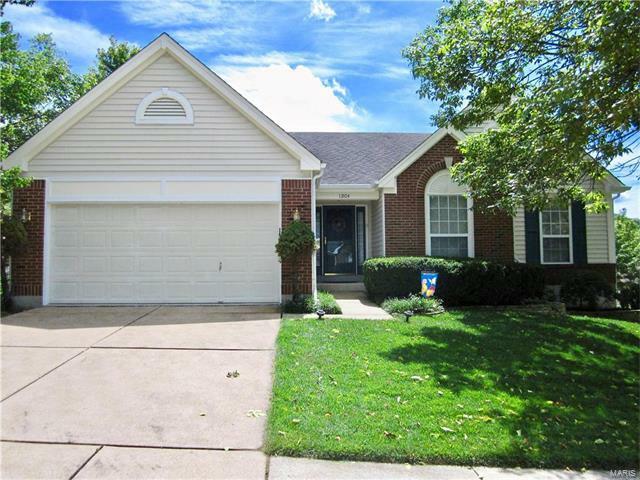 MOVE-IN READY HOME IN A DESIRED LOCATION W/ EASY ACCESS TO HIGHWAYS 270, 44, 40/64. HIGHWAY 270, WEST ON DOUGHERTY FERRY ROAD, NORTH ON BARRETT STATION ROAD, TAKE A RIGHT ON BARRETT MEADOWS DRIVE WHICH IS THE FIRST NEIGHBORHOOD ON THE RIGHT, HOME IS ON THE RIGHT.